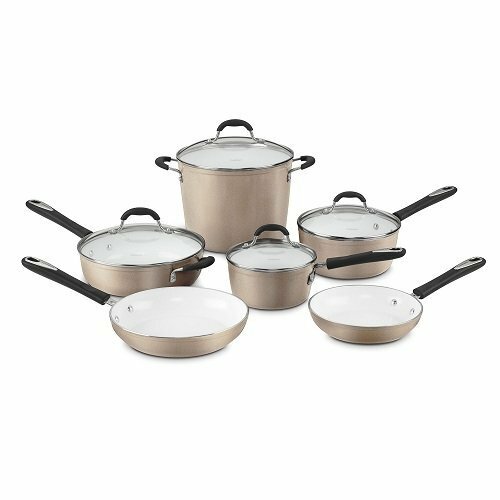 The Cuisinart 59-10CH is a 10 Piece element nonstick champagne cookware set which includes everything a cook needs in a natural nonstick collection. Classics like skillets, saucepans, and a stockpot can handle just about any dish in a cookbook. The heavy gauge aluminum core heats quickly and evenly. Also, it is scratch-resistant and highly durable. 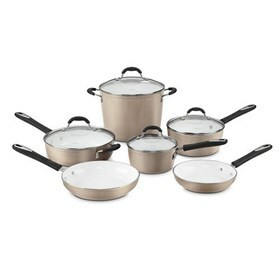 The 10Pc Set Elements Nonstick Champagne has many exciting features for users of all types. The 10Pc Set Elements Nonstick Champagne is sold as a Brand New Unopened Item.